Work is a rapidly changing environment demanding new and fresh employee skills. In addition recruiting and managing talent is essential to keep pace with the demands of a the work landscape. We interviewed Talent managers in over 500 organizations across the globe who answered our second annual survey on the Future of Work, this was conducted via email during the spring of 2017. Strong communication skills top the list of characteristics employees must have to be competitive today. They include writing, listening, speaking and presenting. 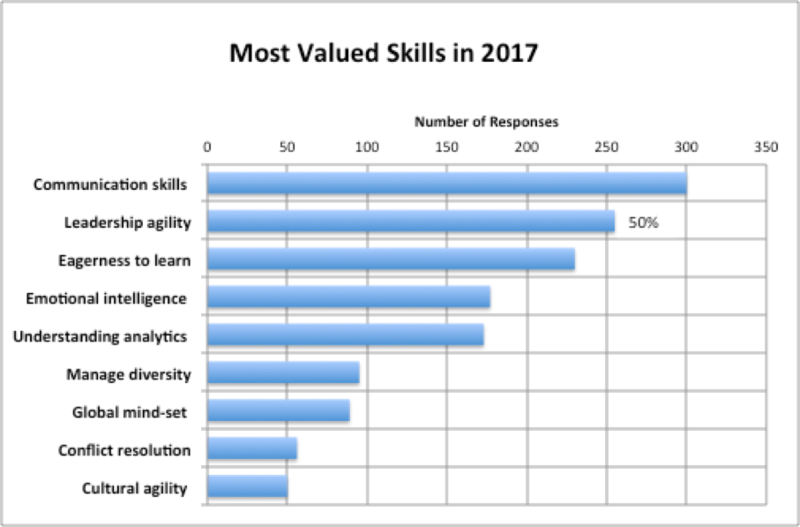 More than half of the 506 survey respondents agree that communication followed by leadership agility are the most valued skills in 2017. Close behind is eagerness to learn [being open to learning, with solid reading, listening and thinking ability]. 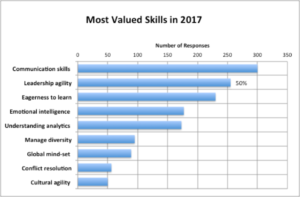 Emotional intelligence [recognizing, understanding, and managing your own and others’ emotions] and understanding analytics [reading and understanding data, projections, demographics] round out the top five most valued skills. Managing change was the most frequently mentioned write-in. General Management and a wide variety of other functions. General managers see Most Valued Skills a bit differently, ranking eagerness to learn ahead of leadership agility. 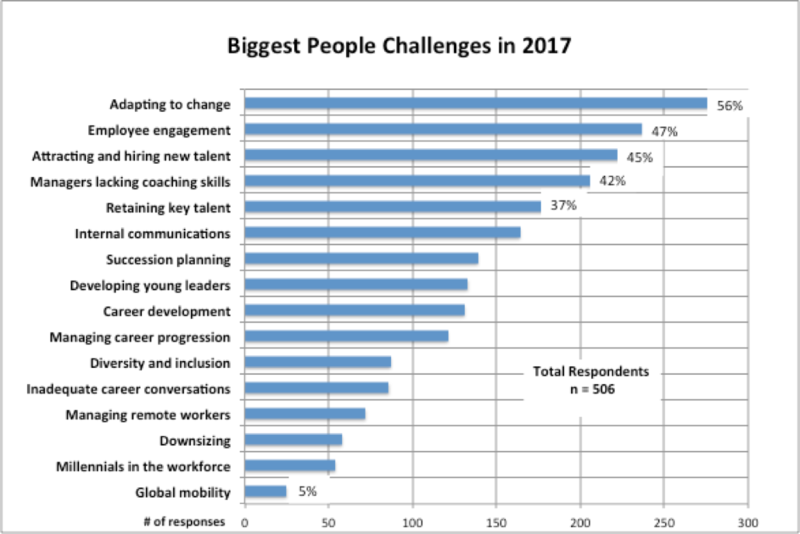 Adapting to change is unequivocally the key people challenge reported by our global respondents this year, followed by employee engagement, which has moved up from #5 in our 2016 survey to #2 this year. 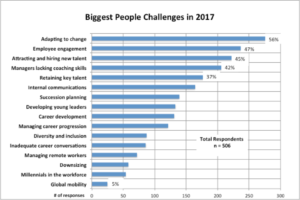 Attracting and hiring new talent was ranked the biggest people challenge of 2016; today it has lost its position, retreating to #3. Retaining key talent has also dropped in importance. Nevertheless, recruiting and retention continue as critical concerns. High on the list of people challenges this year—as it was last year—is the deficit of coaching skills among managers. Managers’ inability to have career conversations coupled with managers lacking coaching skills means a real opportunity to improve is available to those organizations that proactively train managers to coach. Career conversations are the most effective talent development activities according to our survey respondents. With this observation, organizations that haven’t trained managers to conduct effective career conversations have a real opportunity for improvement. Last year, internal leadership development programs, the traditional means of developing employees, was ranked the single most effective way to develop talent, by a large margin. This year, it has been eclipsed by career conversations. Could this mean employers want to shift responsibility for development from the larger organization onto individual managers? Assessments have gained in prominence with a full one-third of respondents indicating they are among the most effective development activities. Mentoring programs and one-to-one coaching by external coaches rounded out the top five most effective ways to develop employees. Self-directed career management resources, which typically take the form of proprietary, web-based e-learning offerings, are relatively new but gaining significantly in popularity. This year they account for 16% of responses, up from 10% last year. Organizations are most challenged today by their need to continually adapt to change and keep employees engaged. The order of the day is recruiting and retaining good communicators and agile leaders who are eager to learn. Managers with excellent coaching skills are well positioned to conduct career conversations that are the most effective way to develop talent. 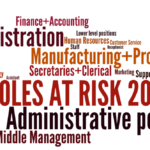 In this environment of high velocity change, the roles most at risk are administrative, manufacturing + production, and middle management. Non-revenue-producing jobs are devalued and many are simply going away. Hda understand your Talent Management challenges: the pressure to exceed business goals, the demands of recruiting and cultivating effective leaders, the pain of job separation and the costs of turnover. We also know that you have your company’s brand to protect. The demands of recruiting and cultivating effective leaders, the pain of job separation and the costs of turnover. We also know that you have your company’s brand to protect. As Talent Management experts, we walk closely with you to compassionately transition employees or develop strength in your executives. We want to help you exceed your business goals through effective career transition, executive coaching, leadership consulting, recruitment and other talent development initiatives.